A Daily Dose of Fit: Keep track of your measurements. If you're making a conscious effort to lose weight, one of the things you'll want to do is keep a log of your girth measurements. Along with your weight, they'll give you concrete evidence that your body is changing. I suggest using a tape measure like the one pictured above (of COURSE mine is pink!) which you can find rather cheaply almost anywhere. And while you'll be able to self-measure some of the key areas, you'll really want to ask a friend for some assistance. This'll help keep the numbers as accurate as possible. 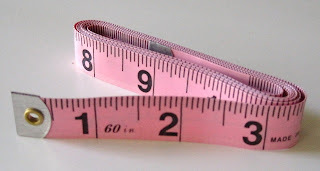 I would recommend measuring yourself every four to six weeks, but ultimately it's up to you!